In 2009, OCEARCH and a team of scientists set off to the middle of the Pacific Ocean on a first-of-its kind expedition to find out why large white sharks were gathering in such a remote part of the world’s largest ocean. 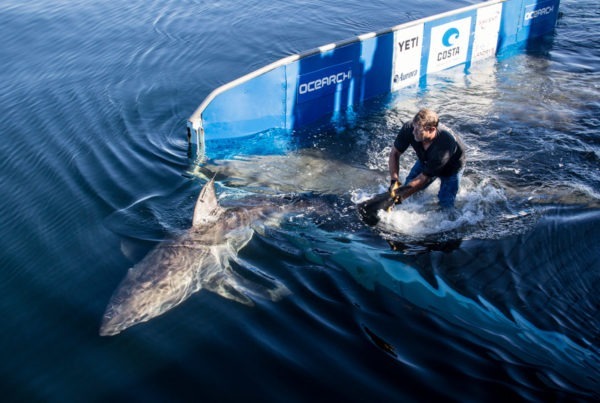 The expedition was important for many reasons but for OCEARCH, it became more special because it resulted in one of the first scientific papers to be published using OCEARCH tracking data. As you know, these peer-reviewed papers are the ammo policy makers need to make responsible ocean-management policies. 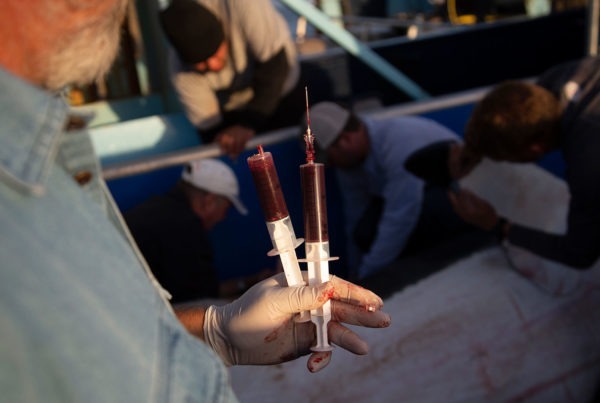 Prior to the 2009 expedition, OCEARCH had already tagged numerous large white sharks in Guadalupe Island. Tracking data showed that many of these large sharks, along with others from separate coastal aggregation sites, would gather in a large common zone between Hawaii and the Baja Peninsula. This zone came to be called the Shared Offshore Foraging Area (SOFA). Scientists were curious to find out what lured the sharks to this zone way out in the middle of nowhere, so OCEARCH donated its ship to help them find out. The expedition kicked off in June 2009 with Chris Fischer as the expedition leader and Dr. Michael Domeier as the chief scientist. 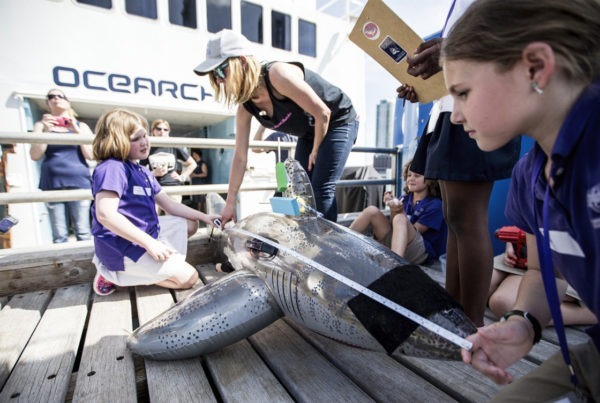 The primary goal of the expedition was to observe the ocean characteristics in the SOFA and find out what made it so appealing to large white sharks. Additionally, if a shark could be tagged in the SOFA, scientists were curious to find out if it would lead them to a potentially new aggregation site. After the expedition, Dr. Domeier published his findings so that the rest of the scientific community could be aware of what was learned and the results were interesting. Since it was speculated that a hotspot for sharks likely indicated a hotspot for other ocean life that the sharks could feed on, the team expected to find a vibrant ocean life. Instead, the scientists found a relatively “cold” spot in terms of life. They found plenty of sperm whale and giant squid but very little other life in the upper part of the water column. Additionally, the SOFA was primarily characterized by downwellings (i.e. the downward movement of fluid), reduced horizontal motion, no major temperature fronts and very low phytoplankton biomass. None of these characteristics were expected. Dr. Domeier was forced to speculate that whatever was drawing the white sharks to the SOFA was not at the epipelagic zone, which is the upper part of the water column that can still receive sunlight. Instead, Dr. Domeier suggests at the end of the paper that there must be considerable biomass in the next zone down called the mesopelagic zone. He reasons that is the only way large predators such as white sharks, sperm whales and giant squid would be able to survive for extended periods of time like they do out in the SOFA. Dr. Domeier’s research and findings were an important piece of the puzzle in uncovering the biology and life history of the white shark. Papers like Dr. Domeier’s are essential to growing our fundamental understanding of our oceans. They provide a toe-hold for other researchers to expand on the initial work and findings. Today, OCEARCH and its collaborating scientists have 22 papers published based on OCEARCH tracking and sampling data, with many more in progress. These papers are important to make sure we manage our oceans properly.